Since 2009, Farhang Foundation has marked the occasion of Nowruz with a splendid celebration at LACMA, which has quickly become the Foundation’s signature program. 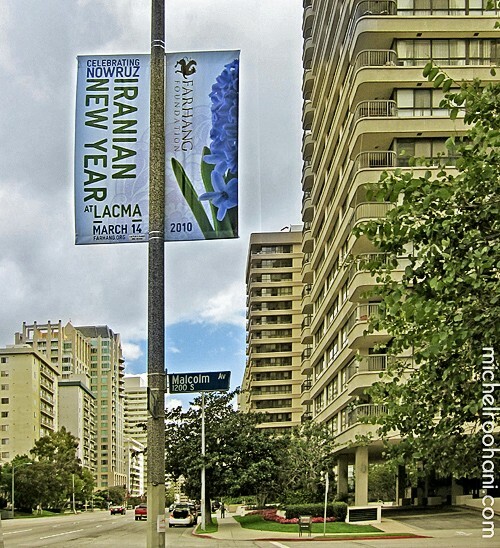 One of its most recognizable features has been the event banners, displayed throughout the month of March along Westwood Blvd., the Wilshire Corridor, and other parts of town. 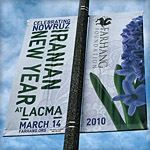 This year, Farhang Foundation calls on you, its valued friends, to design the banners for its 2011 Nowruz celebration at the LACMA, taking place on March 13, 2011. The winning design will be featured on the banners for all of Los Angeles to see and the artist will receive proper acknowledgment and credit on Farhang’s website. By participating in the 2011 Nowruz Banner Contest, you will not only help Farhang Foundation announce the approach of Iranian New Year, you will also welcome all of Los Angeles to share in one of the most beloved aspects of Iranian heritage, Nowruz. To be considered, simply submit your suggested design for consideration, i.e. the “sonbol / hyacinth” as seen in last year’s design. The winning artwork would then be incorporated into the final design layout, which would be combined with the same font as in previous years’ banners. Farhang will work with the winning artist to create the final layout. - Email submission must include full name and telphone number of the artist.